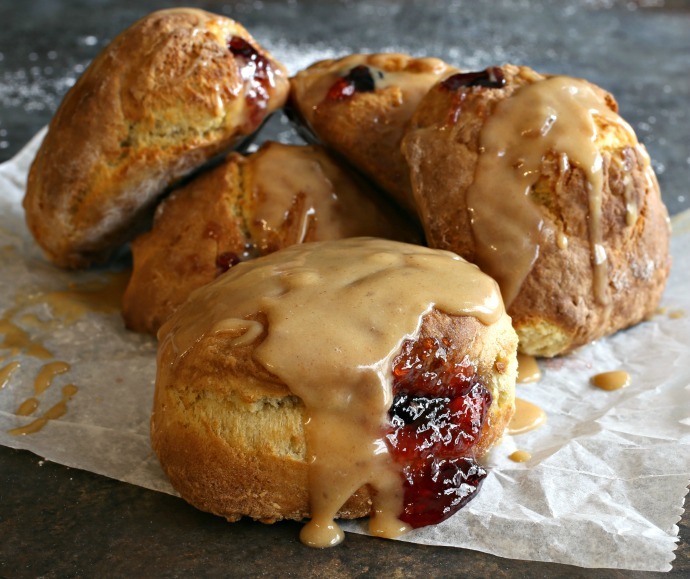 See these hot, fluffy doughnuts, oozing with jelly and dripping with peanut butter glaze? Fresh from the fryer! Oh, wait, I meant the air fryer. Yup. These beauties are an air fryer masterpiece. My air fryer has literally been sitting on my tiny kitchen counter, in my postage stamp sized Manhattan kitchen for days and days because I've been running doughnut batches through it daily. A little more of this, a tad less of that...in an attempt to get really good air fried doughnuts. The kind you'd want to eat, not just because they're better for you. Viola! The fact that my kitchen is covered in flour and the dog has jelly stuck to her was totally worth it when I finally got it right. And I knew I got it right even before I took the latest batch out of the fryer because suddenly my kitchen smelled like a doughnut shop. I've also tested these with a hole in the center, and they were great, but I can never resist a jelly filling. 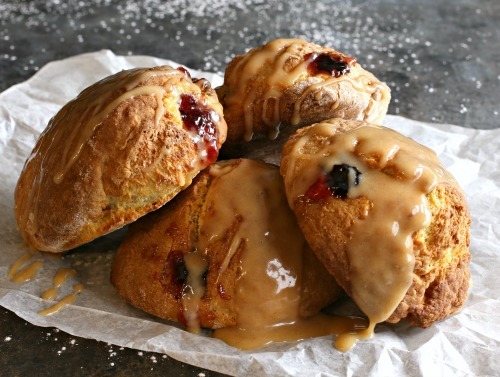 This makes a small batch and is meant to be eaten right away. Not that I've ever found that to be a problem around here. Enjoy! In a large bowl, whisk together the flour, sugar, baking powder, baking soda and salt. In a separate bowl, beat together the egg, melted butter, buttermilk and vanilla. Make a well in the center of the dry ingredients and pour in the wet. Use a fork to combine and then finish stirring with a large spoon, just until the flour is incorporated. Turn the dough out onto a well floured surface. Note that it will be very sticky at first. Work the dough very slightly until it comes together and then pat it out to a 3/4" thickness. Using a 3 1/2" cutter, cut out dough rounds and brush with melted butter. Cut out 2" pieces of parchment paper (doesn't need to be exact) and place each dough round on the paper, then into the air fryer. Work in batches depending on how many will fit in your fryer. Fry at 350 degrees for 11 minutes. 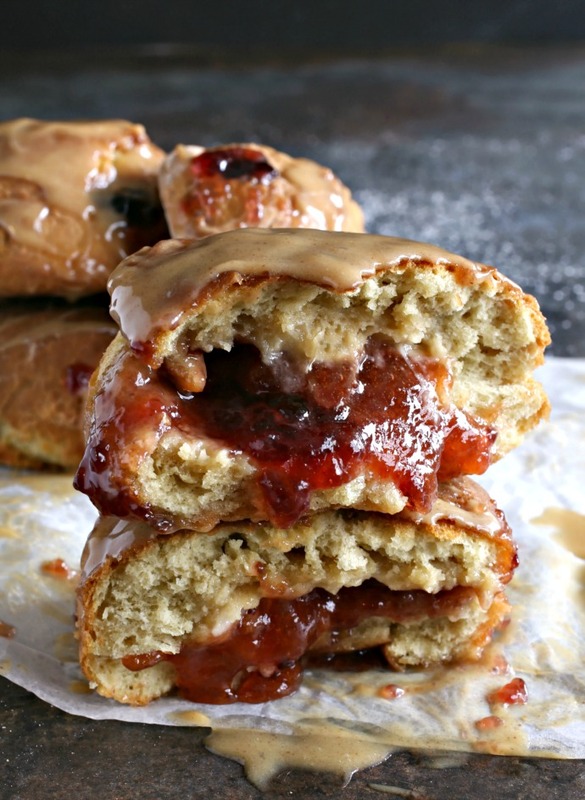 Fill each doughnut with jelly using a squeeze bottle or pastry bag. 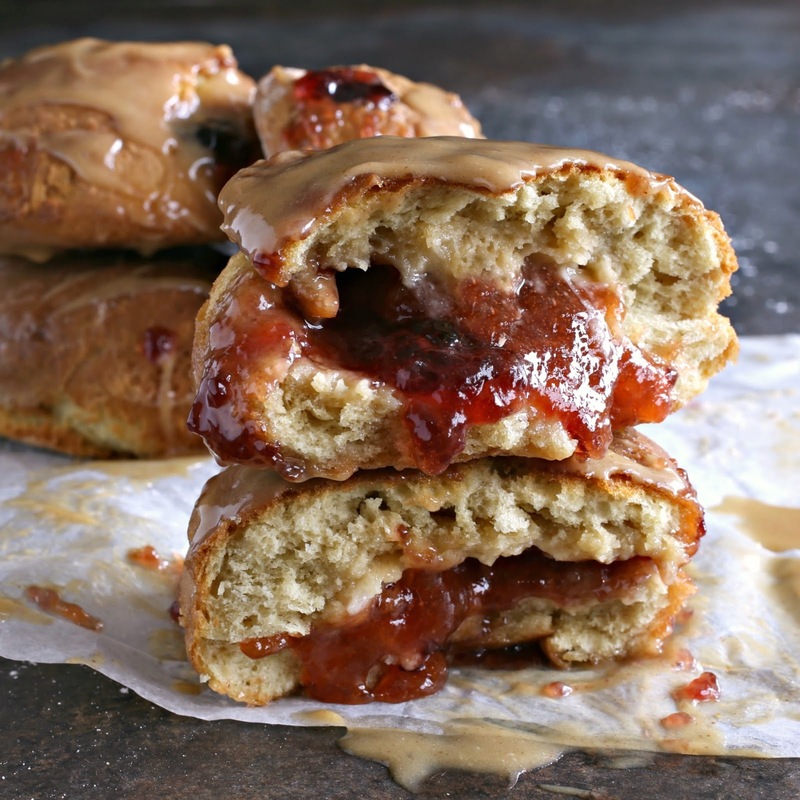 Whisk together the glaze ingredients and drizzle over each doughnut. These doughnuts look so good! Now I'm curious. What's the brand name of this air fryer? Thanks! The fryer I have is the Gourmia. Unfortunately, I am not familiar with what the metric equivalents would be and I don't want to steer you wrong.